Ms. Shana Carpool receives her V.I.P Ride certificate from Angel 7 and the Boss, at N.A.S. Miramar, 12/31/2016. 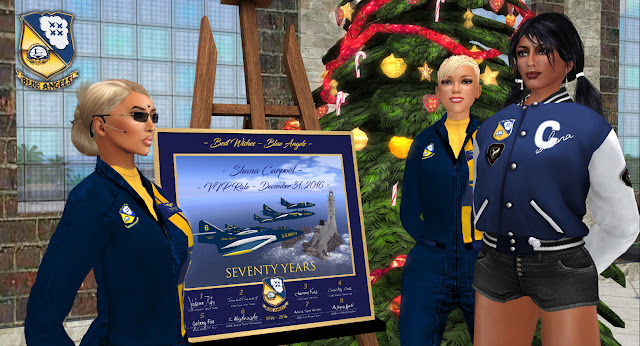 For the longest time the Blue Angels wished to give their chief engineer and engine maker two things: the honorary title of Angel Zero, as a true member of the team, and the V.I.P Ride she of all the very important people in Second Life deserved. Shana Carpool, owner and chief engineer of Carpool Aircraft, the manufacturer of the engines that power the Grumman Cougars F9F-8T and F9F-6, has been outstanding in her support of the team and effective response to all their engine and avionics needs. As an example, the F9F-8T (Carpool Aircraft stock designation TF-9J) the Naval Flight Demonstration Team flew during the 2016 Season went through three engine and avionics upgrades. Her commitment to her work and the great job she does with the Blue Angels are unparalleled. On December the 31st, 2016, "Operation Cinderella" was launched. Objective: to provide the Blue Angels V.I.P. Ride to Ms. Shana Carpool before midnight SLT. The operation was accomplished. 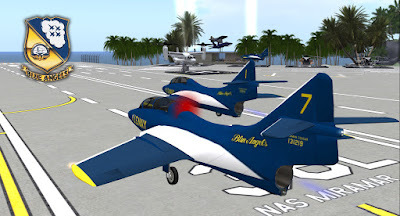 At 18:22 SLT, on the tarmac of Miramar, Angel Zero was aboard Blue Angels 7, with CDR. Asra "Cougar" Kron. For this very special ride, the Boss, CDR. Vickster "Speed" Kuhn, Angel 1, would fly as lead Solo, providing Ms. Carpool with a unique V.I.P. Ride made of two Blue Angels jets flying a Solos routine. The rest is now part of history. Shana in her Angel Zero varsity jacket before the ride, with "Speed" and "Cougar". Angels 1 and 7 hot and static at Miramar. "Ready to take off?" "Ready Boss!" The Blue Angels, all of us, across team compositions in the year 2016, wish to dedicate the following song to Shana Carpool as it says all that our hearts hold for her. She is truly the wind beneath our wings and we fly high in the sky because she makes it possible for us to shine. Her strength is our glory, and our glory is hers. She is our hero. From all of us, a heartfelt thank you. Thank you, Shana.